LeToya Luckett stopped by YBF HQ right before her new "Back 2 Life" album dropped (available everywhere TODAY!). And chick had some stories to tell. Because, life. 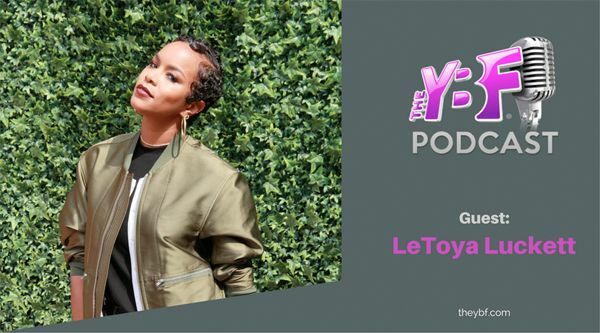 Get into the new episode of The YBF Podcast with LeToya inside..
LeToya and TheYBF.com's Founder/EIC Natasha Eubanks poured up some Ciroc Summer Colada and started spilling all their feelings. The gorgeous (like, sickeningly gorge) singer and actress dished up the advice (and tea) on everything we've been wanting to know, including some advice for her newly separated good friend La La Anthony. We also find out how LeToya found a new BAE! She talks about everything: What really happened with ex-fiance/husband Rob Hill Sr., that extra personal "Back To Life" video anthology, major out with Thomas Q. Jones, staying in her lane, acting updates, trying to not be mad she’s single while watching all these couples on Instagram, our sleepover, her status with Miss Tina and Destiny’s Chil’ren, people’s instagram lives getting her in her feelings, MAD nuggets about the ambitious, successful woman’s relationship struggle in 2017, and being besties with Ludacris’ wife Eudoxie. Oh, and she tells a hilarious mugshot-filled dating story while she does YBF’s Fast Fab 5 challenge.